This is a very nice simplified version of Art's Original Flying Saucer rockets which flies great and can be launched on a wide variety of 24mm motors. One sheet of cardstock to make up the top/bottom shrouds and shroud tabs. One pre-marked 7" piece of foamboard to make up the center plate. This was my first Art Applewhite build and although the construction techniques are somewhat different from a 4FNC rocket, they are quite easy to master. The components are top quality and the instructions very thorough with no obvious gotchas so that even complete rocketry novices should have no problems constructing this rocket. Firstly, the top and bottom shrouds are cut out from the provided cardstock and the provided shroud tabs are glued into place. After cutting out the holes for the launch rod and motor mount, each shroud is then formed by gluing each respective side on to the tabs. The center plate is then made up by cutting along the pre-marked outer line with a sharp X-Acto knife. It is a good idea to make this cut with a progressively deeper series of cuts rather than trying to cut through in one hit. After cutting out the pre-marked holes for the motor mount and launch rod, a shallow cut is applied to the pre-marked inner line to facilitate ease of cutting to form a 30 degree beveled edge which will enable the top shroud to mount to the center plate. The beveled edge is then done by cutting at a 30 degree angle along the outside bottom edge to the above mentioned shallow cut. Be sure to use a fresh X-Acto blade for this as a blunt blade will prevent a clean cut being made and could possibly damage the foamboard. Once formed, I sanded the beveled edge smooth with 180 grit sandpaper. The top shroud is then glued into place on the beveled edge and the glue then allowed to dry. Glue is then applied to the center plate's motor mount hole and the motor mount pushed into place through the bottom until the top slightly projects past the top of the shroud. Once the glue was dry, I then applied glue fillets where the motor mount meets the top shroud and center plate. The bottom shroud is then glued into place after which I applied glue fillets to where the bottom shroud and center plate meet and to where the motor mount and bottom shroud meet. During this whole process, it is imperative that all three launch rod holes are aligned with each other. Art recommends that only white glue be used during construction so I used Selley's PVA throughout. This rocket is a cinch to finish with the only finishing technique recommended by Art being an application of clear coat paint to protect the cardstock from moisture for which I applied a single coat of Tamiya Clear acrylic. This rocket is designed to be launched using a 3/16" launch rod. The first flight was with a D12-3 (friction fitted) with which I was not familiar and upon launching, the motor ejected itself through the top under power which thankfully left the rocket undamaged bar some soot on the top shroud. Ditto that for the second flight. After liberal use of masking tape on another D12-3, the third launch was successful with the rocket taking off slowly and merrily with lots of noise and smoke to the amusement of spectators. Ditto that for the fourth flight. 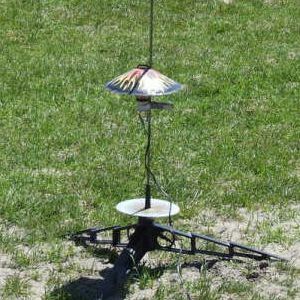 Recovery is a cinch due to the rocket employing aerobrake (tumble) recovery and is especially amusing to watch if using a motor with an ejection charge as ejection will cause the rocket to spin end over end during descent. As a consequence, the rocket also recovers quite close to the launch pad which makes this rocket ideal for use in 5-10mph windy conditions. This is one heck of a great rocket for flying in small fields which can be built in an hour or two then flown on the same day. Once built, the rocket is surprisingly robust and I managed to obtain fourteen awesome flights with this rocket till a malfunctioning D11-P caused the rocket to CATO. I have since flown other UFO rockets supplied by Art and cannot recommend his products highly enough.